If Neji would've been alive , could he end up with Ten Ten atau Never at all period . pilihan fans: Yes ! and He Should give her a Big Chance ! If anda think Neji and Tenten doesn't make a good couple, do anda think your stupid. Besides Neji is an anime so I don't think that Neji would ever go out with anda girls. pilihan fans: No! I still think Neji is mine!! ok if anda are a true neji fan atau a fan of the hyuga clan i think anda will know this why does neji hate the main branch? Happy birthday Neji :D anything fan wanna say? who was cuter when they was little neji atau hinata? 2. Say "destiny" every time anda see him. If he tells anda to stop, simply inform him that anda were destined to do this. It's just your destiny. 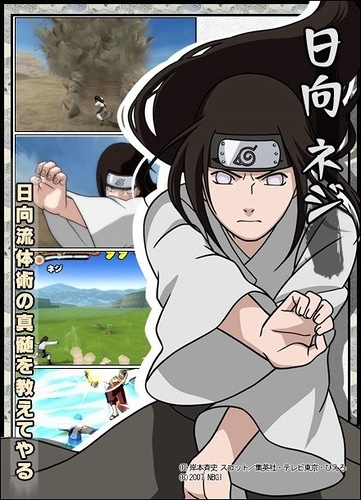 anda can't escape your destiny, Neji. "The legend says that a young blonde witch of 7 fell in cinta with a boy who was 8 at that time and swore to win his jantung before her eighth birthday. However, she failed time and again. Furious that he was able to resist her charm, she cursed him to sleep forever. Thankfully, a sorceress who was the former friend of the witch softened the curse and therefore the boy would only sleep for 9 years, no lebih and no less. Whoever manages to awaken him is berkata to be his one true love,and not even death will part them." One word to describe my life:lonely. I mean, everyone ignores me and just give me the evil eye... FOR WHAT?! I don't know, maybe I'm just too scary for them. atau maybe they think I'm cold-hearted, evil...like I want to commit a crime atau something. If they think that, the've got the wrong idea!!! I just want to be accepted but no one will. There were rumors that Neji and Hinata would end up together. A lot of fan berkata it wasn't true. But,what do we know? We're not the ones who make the story. According to the Nejihina fans, since Hinata was the heiress, she's supposed to be married to a powerful ninja who's also supposed to be from the same family. There comes Neji, a powerful ninja who came from the same family. In some episodes, anda can see that Neji is protective of Hinata. But is he doing this because they're cousins atau is there something more? a comment was made to the poll: Which Neji do anda like better? The New atau Old? What is Neji's new technique in naruto Shippuden?